New Hampshire was the first to claim its independence from Great Britain, six months before the Declaration of Independence. The original founders of McDonald's were born here, as was the comedian/actor Adam Sandler. The dense forests here provide some of the finest lumber in the country, and the mountains provide the largest ski slopes on the east coast. Many come here for recreational activities and delicious seafood. If you’re thinking of moving to the northeastern tip of the United States, then you’ll definitely have no problem finding a safe city to move to. 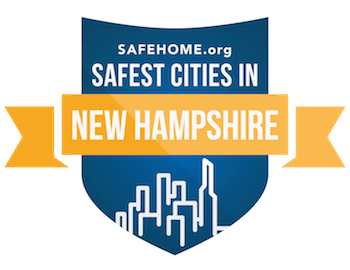 The 25 safest cities of New Hampshire have all been experiencing a drop in their violent and property crime rates. Their crime rates were already on the lower end, so this is quite remarkable. The 25 safest cities have a safety score ranging from a high of 93.33 to a low of 68.68. Most of the cities are sparsely populated though, with only one city having a big enough population and safety score to make it onto the top 500 safest cities in the nation. Hanover is the safest city in the state, with a score of 93.33 and a population of 11,410. This city is highly regarded as one of the best cities in the nation, with the ivy league university Dartmouth located here as well. The median income is a high $90,548 for a family. This city has two of the main factors that contribute to a safe city, between the excellent educational facilities and a much higher than average income level for those who reside here. Closer to the coast line is Exeter, with a safety score of 91.93 and a population of 14,306. Most of the other safest cities in New Hampshire will be clustered in the southeastern part of the state, as its closest to Boston, the biggest city for hundreds of miles.